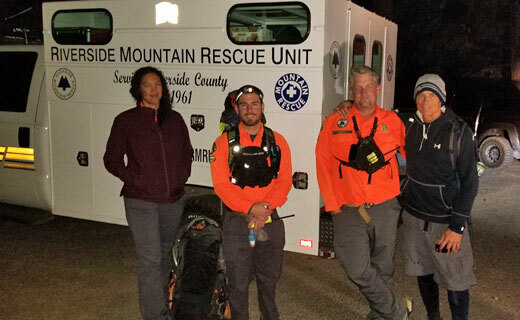 2100 hours, the call for a lost hiker (Richard) on the Willow Creek trail comes out. I meet Tyler at the Aviation Hanger only to be told by STAR-9 that the mountain is socked in and they would be unable to fly. We get the message to the entire team that this is no longer a hoist, but a full team callout. Tyler and I head to Humber park and begin our hike up Devil’s Slide. If the subject stays put it will be about a 6-mile hike to him. If he moves and we cannot find him Shani and Alex will start up the trail heading towards Tahquitz Valley. About 1.7 miles up the trail Tyler goes “Did you hear that?” We stop and hear a call for help. We respond “Richard?” and confirm it is him. He is on the Devil’s Slide trail hiking down. We quickly meet up with him using his cell phone as a light source and provide him with water, calories and a head lamp. We made it back to Humber park at 1:30am the next morning. What went wrong? Richard went to hike the peak starting at 2pm from the tram. He decided to come back down at some point and missed the turn at Wellman’s Divide. He took this to Saddle Junction and then started down Willow Creek Trail. Temps were in the high 30s and being lost and cold clouded his judgement causing him to back track multiple times trying to find a way out being unsure of his location. Once on the phone with RSO they were able to calm his nerves and he was able to return to Saddle Junction. RMRU Members Involved: Eric Holden, Shani Pynn, Alex Rilloraza, and Tyler Shumway.